IN some warm countries the rain does not fall for six months at a time. Then the grass all dries up, the leaves curl up on the trees, and the flowers die. But when the rainy season begins, the seeds that have lain asleep in the dry ground spring into life, and clothe the earth with beauty. There are some plants that are especially fitted to live in such a dry climate. One of these is the cactus. This has large, fleshy leaves, that can hold food enough for the plant to live on all through the dry time, just as onions and such plants store up food in their leaves to make seeds with the next year. 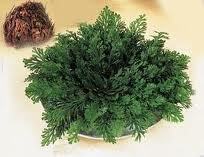 Another plant especially fitted for a dry country is the curious little Resurrection Moss. You can see by the picture on this page how this plant looks. It grows in the cracks of rocks, so that it can get very little moisture by its roots. On the underside of this ball was a bunch of fine, thread-like roots. She told me to come over in the afternoon, and see it again. Then she filled the saucer with water, and set it on the table. The next time I saw it, I could hardly have told that it was the same plant. The little, dry bunch had spread out into a mat of beautiful, dark green moss, like this one in the picture, except that there were ever so many more leaves. These plants must make the bare rocks look very pretty when, in the rainy season, they wake up from their long sleep, and dot the rocks with beautiful green rosettes.